Harvesters of Souls Trailer: The Ballad of Buster Scruggs! The Ballad of Buster Scruggs – Buster Scruggs (Tim Blake Nelson) – Photo courtesy of Netflix. Joel and Ethan Coen’s western anthology film The Ballad of Buster Scruggs has a spiffy new trailer – with new footage and a sprinkling of quotes from high-powered critics. The Ballad of Buster Scruggs – winner of the Best Screenplay award at the Venice Film Festival – premieres on Netflix on November 16th. Idiosycratic Trailer: The Ballad of Buster Scruggs! The new film by the unique Coen Brothers, The Ballad of Buster Scruggs, has its first trailer and it is most definitely the idiosyncratic and weirdly delightful trailer you would expect for a Coen Brothers anthology film. Counting James Franco and Tim Blake Nelson among its cast for the six western tales it tells, The Ballad of Buster Scruggs will premiere in select theaters and on Netflix on November 16th. The Best Comedy of the Year, The Big Sick, Hits Home Video! The story of a real life romance and near tragedy, The Big Sick (we gave it an A+) is coming to Blu-ray and DVD on September 19th with a goodly supply of extras, including an Audio Commentary by Actor-Writer Kumail Nanjiani, Writer Emily V. Gordon, Producer Barry Mendel and Director Michael Showalter; featurettes, deleted scenes and more. The Big Sick: The Best Romantic Comedy of the Decade! The Big Sick may be the latest entry in the Judd Apatow lifts gifted comics to the next level sweepstakes, but it is very much not a Judd Apatow film. Written by Kumail Nanjiani and his wife, Emily Gordon, The Big Sick is the mostly true story of how the couple met, fell in love, broke up and would probably never have seen each other again if she hadn’t gotten so sick she needed to be placed in a medical coma. Love Is Hard Trailer: The Big Sick! The Big Sick – Emily (Zoe Kazan) and Kumail (Kumail Najiani) – Photo courtesy of Amazon Studios. Based on events from his life, The Big Sick stars Kumail Nanjiani as Kumail, a nice Muslim guy and stand-up comic who meets Grad student Emily (Zoe Kazan) after a gig. Their connection proves to more than a one-night stand – the real thing, in fact – but the problem is that he his family have certain expectations for him. When Emily falls ill, Kumail is forced to deal with her parents (Ray Romano, Holly Hunter) – whom he’s never met before. The Big Sick will be in theaters on July 14th. What If The F Word Was Friend? What If is the latest movie to tackle the question of whether a man and a woman can just be friends. Its subjects are Wallace (still, a year later, not able to get over a horrific breakup) and Chantry (an animator with a great boyfriend). Titled The F World everywhere except in the U.S. and the UK, the film is actually more deserving of the bland new title than the edgier original. What If There Was a Trailer for What If? Originally entitled The F Word, What If is a romantic comedy that asks the question, ‘what if being friends has its benefits’? 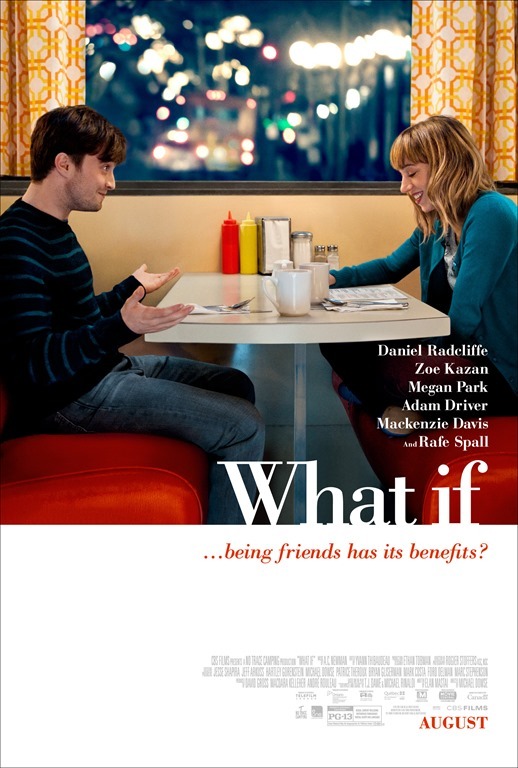 It stars Daniel Radcliffe, Zoe Kazan, Adam Driver, Rafe Spall and Megan Park. What If is scheduled for an August release. Check out the trailer after the jump. 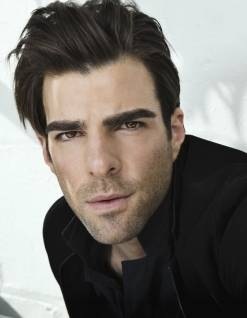 Zachary Quinto (Star Trek, Heroes) and Robin Weigert (Deadwood), among others, will be starring this fall in Signature Theatre Company’s Off-Broadway production of Tony Kushner’s ANGELS IN AMERICA. ANGELS IN AMERICA, which will be directed by Michael Greif, will begin performances on September 14, 2010 at The Peter Norton Space (555 West 42nd Street) in New York City. Opening night will be October 28, 2010. ANGELS IN AMERICA was one of the most critically acclaimed and heralded plays of the 1990s and established Tony Kushner as a major new voice in world theatre. Frank Rich, The New York Times, praised it as “the most thrilling American play in years”. Kushner adapted the plays for an HBO mini-series, directed by Mike Nichols, which premiered in 2003 and won Golden Globe and Emmy Awards for Best Miniseries. ANGELS IN AMERICA: A GAY FANTASIA ON NATIONAL THEMES is set in late 1985 and early 1986, as the first wave of the AIDS epidemic in America is escalating and Ronald Reagan has been elected to a second term in the White House. The play’s two parts, MILLENNIUM APPROACHES and PERESTROIKA, bring together a young gay man with AIDS (Christian Borle) and his frightened, unfaithful lover (Zachary Quinto); a closeted Mormon lawyer (Bill Heck) and his valium-addicted wife (Zoe Kazan); the infamous New York lawyer Roy Cohn (Frank Wood); an African-American male nurse (Billy Porter); a Mormon housewife from Utah (Robin Bartlett); and a steel-winged, prophecy-bearing angel (Robin Weigert); as well as the ghost of Ethel Rosenberg, an ancient rabbi, the world’s oldest living Bolshevik and a Reagan administration functionary, among many others – all played by a company of eight actors. The lives of these disparate characters intersect, intertwine, collide and are blown apart during a time of heartbreak, reaction and transformation. Ranging from earth to heaven, from the political to the intimate to the visionary and supernatural, ANGELS IN AMERICA is an epic exploration of love, justice, identity and theology, of the difficulty, terror and necessity of change.